Item has to be returned within 15 days of purchase for refund. A Shipping & Handling charge applies if a product is returned for exchange. Only the cost of the item is refunded in case of return. WE DO NOT SELL USED OR REFURBISHED ITEMS. Refund can not be given for returned engraved/custom items unless engraving/custom is not done according to customer's written instructions. Returned items without the original box will not qualify for refunds. 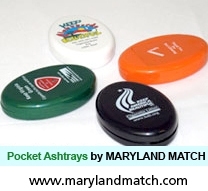 Copyright © 2006 Pocket Ashtrays.